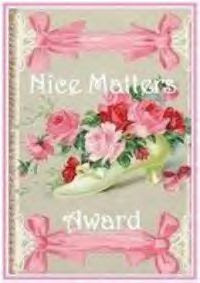 What is a Nice Matters Award? This award is for those bloggers who are nice people; good blog friends and those who inspire good feelings and inspiration. It is also for those who are a positive influence on our blogging world. Once you've been awarded please pass it on to others who you feel are deserving of this award." You are then to name 5 bloggers whom I think deserve this award! I could keep my inspiration list going - and if you haven't already checked them out - all the girls in the Bloggers Challenge list to the left also deserve this award for their weekly inspiration. Congrats -- you definitely deserve it. Congrats and thanks! You are the best!